You and I are broadly of the same generation, and I would suggest that any differences that we might have on foreign ownership of Australian property, assets and/or brands are going to be fairly marginal. And that they are going to be miniscule when compared to the differences that we will have on this issue with our children and our grandchildren. Fundamental changes are taking place in Australian society which mean that future generations will view this question in completely different ways. In 2001, the futurologist, Jeremy Rifkin, published a book entitled, ‘The Age of Access’. His proposition was that ownership of property was being devalued. Increasingly, companies avoided amassing physical capital. They were outsourcing ownership, contracting third parties to provide and maintain equipment. Increasingly, what they wanted was assured access to assets and the associated services. A decade and a half later, I would argue that the age of access has arrived. We don’t buy an apartment, we rent. We don’t store documents on their hard drives – a form of ownership – but in ‘the cloud’. We don’t own a car; we use Uber or access a vehicle through Go Get or Car Next Door. We don’t own a bicycle; we hire a ‘Boris bike’. We don’t own videos or DVDs any more – we download from Netflix. Young people don’t own CDs or even download music onto their iPhones; they stream music through a service such as Spotify. Now, I have to confess that I am not entirely comfortable with this – I own my principal place of residence. I shut down OneDrive on my computer, and I back up onto hard drives at work and at home. I carry around a wad of $50 notes in my wallet. Except in rare cases, I buy books rather than download to kindle. Two rooms of our house are shrines to that physical artefact, the book. But what I think doesn’t especially matter. Rifkin was right – most young people today are at comfortable with access. Lawyers and economists argue that ownership is just a bundle of rights. In the private sector, we use the law of contract ensure that we have access to key rights in the bundle – either a bundle that used to be entirely ours, or a bundle, the key parts of which have never belonged to us, and which we have only ever accessed through contract. Government is able to use regulation, compulsory acquisition and golden shares as well as contract to achieve those same ends. While we may, for a time, continue to attach symbolic significance to certain rights in that bundle, the Victorian government has just demonstrated that even Labor governments in this country are willing to dispose of many of the functional elements of that bundle, with sale, in part, to foreign interests. Now that brings with it a number of implications. As they fractionalise these bundles of rights, governments must learn how to be much more effective in protecting key interests through regulation and contract. Another way of thinking about this is a shift away from owning physical assets towards procuring services. This shift from assets to serves is inevitable by-product of the division of labour and the pursuit of comparative advantage. It is an indication of our growing prosperity, and, surely, a sign that we are moving up Maslow’s hierarchy of needs, that we are developing an economy increasingly based on the services necessary to meet higher level human needs. My point was that we couldn’t export the physical asset, but we could sell the associated services. Without policy, design, financial, engineering, maintenance and traffic management services, the Sydney Harbour Bridge is just a pile of steel and concrete at the side of the harbour. It was the services that gave those materials meaning. And those services could be exported all over the world. I used an historical analogy – the Netherlands, which dominated hydraulic engineering across Europe for more than five hundred years. The foundation of this massive export industry lay in their technological dominance of hydrology – not just windmills, which were a relatively late invention – but the use of canals and ditches, sluices and dikes. It is not widely recognised that a large proportion of the Dutch polders – the farming districts reclaimed from the marshes – were constructed and managed by private cooperatives and financed by private capital. And the polders had to be organised in such a way that the farmers and villagers all undertook their share of the work. The Dutch possessed unrivalled expertise in the organisation of new village communities made up of free settlers who relocated to the reclaimed land on condition that they could govern themselves. They pioneered new capital-raising techniques that probably laid the foundation of the joint stock company, a business model that would later be exported from the Netherlands to Britain and North America. And the Dutch exported these services throughout the known world, initially to Germany and then to Italy, France, England, Russia and Spain. The massive works undertaken in draining the fens of eastern England throughout the late 16th and early 17th centuries were managed by Dutch engineers, using the labour of Dutch settlers, and (in the early years at least) financed by Dutch capital. The first of the private companies that supplied water to the city of London was established by a Dutch entrepreneur, using leading-edge water-lifting technology, based on an exclusive franchise granted by government that lasted for a century and a half, and was meant to last for five hundred years. How did such a small and war-torn country come to dominate this area of expertise? The obvious answer, surely, is that the Dutch made a virtue of necessity. But that is only part of the story. Germany was also covered by a vast expanse of wetlands that held back agricultural expansion. And yet the Germans failed to develop an infrastructure services industry capable of being exported abroad. Something else was involved. The Dutch created a hotspot and they exploited it. Yes, they had originally developed these capabilities to deal with a domestic problem. But they built upon it. They were probably not the first movers in lifting water, reclaiming land and founding new settlements. But they were the first to develop a comprehensive range of services – civil engineering, capital raising, operations and maintenance, town planning and community governance – that enabled foreign governments to extract economic value from these new technologies. They were the first to develop a workable model that was capable of being exported abroad. And if the size of their domestic market had anything to do with their international success, it lay in the realisation that if they wanted to magnify their infrastructure services capabilities, they had to expand into other jurisdictions. Australia has been a world leader in selling education services to the world, in particular to Asia. It is our third largest export after coal and iron ore. In NSW, it is our second largest export. In part that has involved the provision of education services here in Australia, often bundled with rights of permanent residence and citizenship. But increasingly Australian universities have been establishing campuses overseas, often in joint ventures with local universities. Why are we worried so much about ‘selling the farm’ when farming is such a small (and shrinking) proportion of the national economy? The answer, I suspect, lies in the symbolic value attached to ‘hearth and home’. And while we will debate these issues for years to come, I wonder how much these symbols will continue to resonate among our children and grandchildren. And to some extent, our concern arises from a decline of public-ness. There are a number of serious issues associated with the sale of state-owned assets – Rod Sims has pointed to the temptation facing all governments to weaken the regulatory constraints on price in order to inflate the value. First of all, the Georgian silver goes, and then all that nice furniture that used to be in the salon. Then the Canalettos go. But of course, Macmillan’s quip shows what an antiquated concept state ownership of public assets had become. The Victorians built magnificent edifices to house their post offices in towns right across the country. We still see them there today, the GPOs in Martin Place and Bourke Street – planted right at the heart of the metropolis where businessmen went each day to collect their mail and to socialise. Today, they are cafes, hotels and boutiques. Now as someone who still has a GPO box, I resent having to sneak up a back alley off George Street each morning to collect my mail, as often as not making my way up the stairs because the escalator is broken. But in truth, what killed the post office was not ideological bastardry but technology. My email is now delivered by a multinational corporation whose ownership I neither understand nor care about. The ownership of telecommunications, electricity, gas and water are irrelevant to our sense of public-ness in the modern world. These are commodities that we buy and sell without regard to the entities that supply them. I think that publicness – community – matters – but it has been transformed as much by the welfare state, where financial transfers are anonymously deposited into a bank account in the middle of the night, as much as by consumerism. Our children will approach this question of community and public-ness in entirely new ways. The fourth large shift taking place in our country is the transformation of concepts of nationality and citizenship. I am reliant on others for these numbers, but we are told that around half of Sydney’s residents were born overseas. Almost all of those individuals will have complex notions of nationhood, and many of them will have dual citizenship. An increasing percentage of them – in excess of 8% of Greater Sydney – are of Chinese descent – and that percentage will rapidly increase in the years ahead. They have a very different view of Chinese investment in Australia than those of us with an Anglo-Irish heritage. I have done a great deal of family history over the past year – mine is an old Anglo-Irish family – all convicts and gold rushes. With the exception of an Irish grandfather, my wife is the same. Over the course of two or three decades, that has radically changed. My youngest brother is married to a Haitian and his children have a very different concept of Australian-ness than we did. My second daughter, who has British citizenship from out ten years living in the UK, is serious about an American living and working here in Australia – she is torn between her Australian-ness and her British-ness. My second son spent four years working in Brazil and is serious about his Paraguayan girlfriend (who did her post-graduate studies here). You can all tell stories such as this. Our children and our grandchildren are citizens of the world, in ways that very, very few of our generation were. They have complex national loyalties, and their children will be even more complex again. They will use the word ‘foreign’ in ways that are profoundly different from how our generation have. Personally, I feel deeply uncomfortable about the sale of the Kidman estate to overseas interests. 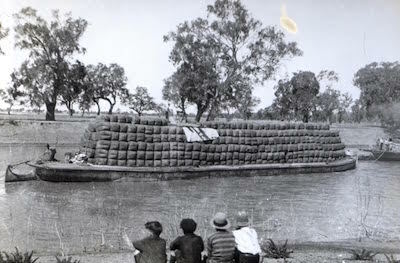 In part, that is a function of scale, but it is much more the part that the Kidmans played in the history of Australia. But how many people of our generation know or care about that history, let alone our children’s generation or that of our grand-children? Ownership still matters, but much less so than was the case in the past. Physical assets retain their significance, but increasingly we live in a service economy, where we are much more concerned with securing the benefits that services bring. NSW RMS now speaks of roads as a service. Concepts on community and public-ness matter, but they are no longer manifest through the public edifices that populate our main streets – that change has taken place in our lifetime, and it will change even more in that of our children. Concepts of nationhood and citizenship are being transformed – it is difficult to imagine that the Chinese-Australians who will dominate the population in the decades ahead, are going to think about these questions of ‘foreign investment’ in quite the same way as we do. Very thought provoking talk. Just a minor point first, bike sharing hasn’t taken off here, as it has in London and parts of Europe. All regular bike riders own their own bikes. Sharing could work in the CBD and Nth Sydney for example. Interesting to postulate that it’s access not ownership and with government regulation and contracting of services we all can have housing, health services, electricity etc. It would require a government with the ability to regulate and enforce those regulations. Further these regulations should balance the interests of the consumers with the need of the provider to make money. Where there are few, large providers of services it appears that the government contracts and regulations frequently are overgenerous to the providers. In the US the pharmaceutical industry has close links to the body that approves new drugs and actually drafts legislation and regulations for Congress to approve. The outcome is not desirable for patients. Canada, possibly because of a social democrat tradition, has been more successful in withstanding the pressures of the pharmaceutical industry. For this system to work the governments must keep the welfare of their population to the fore in any decision making. I was very interested to read that the Netherlands dominated hydraulic engineering across Europe and that the foundation of this massive export industry lay in their technological dominance of hydrology.